People complain about micromanagers, about being over worked or about unrealistic expectations. But even good bosses often need to get into the details of someone else’s work, give people a lot of extra work and set very high standards. Also, there are perfectly good reasons why good bosses might not be able to deliver on all the expectations set by their own leaders. Spotting the impact of a bad boss isn’t always this easy. Regular or massive defection from a team means that there’s likely a really bad boss in charge. Another good indicator is people leaving for, what appears to be, a similar job at a similar organizational level, or if they’re taking a pay cut or giving up some organizational status. If it looks like people are taking a step down or backwards in their careers, they’re probably trying to get away from a bad boss. Poor leaders try to look better by criticizing others. Of course, they probably know that it’s never smart to trash-talk their peers or their own leaders, but poor leaders will complain about their team. They talk about how they have to swoop-in and fix all the issues that their team missed or didn’t understand. They are uncomfortable giving their direct reports the spotlight. If there are performance issues on a team, good leaders take responsibility for the issues, quietly improve performance, then give credit to the people who stepped-up and delivered. Poor leaders are often insecure. Because many haven’t been able to keep a job for more than a couple years, they’re worried that they’re going to loose their current job, too. Of course, they’re not self-aware enough to see how they are responsible for their career missteps, so they blame others. They think that people are talking behind their back and conspiring against them. Poor leaders often react to their paranoia by being overly political. They focus too much on creating friendships at work and too much on doing favors. Political skill is critical for leaders, but poor leaders don’t know how to manage it and appropriately dial it back. Poor leaders quickly destroy trust. Team meetings will be unusually quiet because no one is comfortable making suggestions or challenging the leader’s direction or perspective. Meetings are often just a download from the leader. If the leader asks any questions, answers will be exactly what the boss wants to hear. 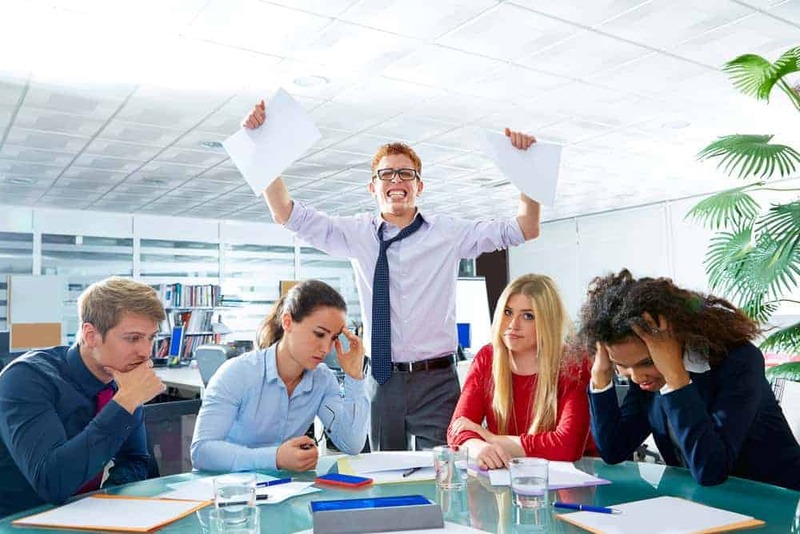 Team members have likely already suffered the consequences of challenging their boss. They’re supporting the status quo until they can get a new boss or a new job. Often, team members know that if they want to get something done, it’s best to keep the bad boss in the dark. Informing or involving their boss probably means that nothing will get done, it will get done wrong, or their boss will use the occasion to support their own paranoid political agenda at the expense of getting good work done. Team members are going to their boss’s boss for direction and decisions because it’s the only way they’ll be able to move the work forward. When we see these issues and behaviors in the workplace, we get anxious. That’s normal and, I think, it’s good. It means that we’re not comfortable with the status quo and, hopefully, we want to do something about it. How organizations are led is something within our control. Improving leadership is one of the greatest contributors to organizational success and it’s how we can create truly thriving workplaces.